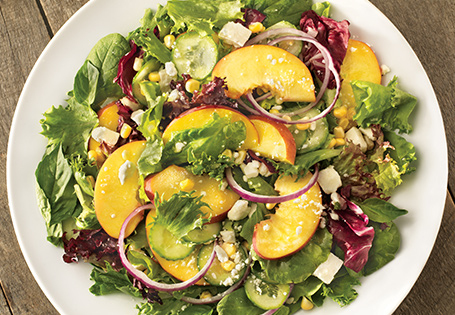 In a large bowl, toss peaches, cucumbers, corn kernels and onion with dressing. Place salad mix on serving platter or large bowl (to serve). Arrange fruit & onion mixture over salad base. Garnish with lime zest, basil leaves and crumbled feta cheese.